We are now sold out for Thanksgiving! Thank you everyone, we are very much looking forward to serving you a delicious holiday meal! 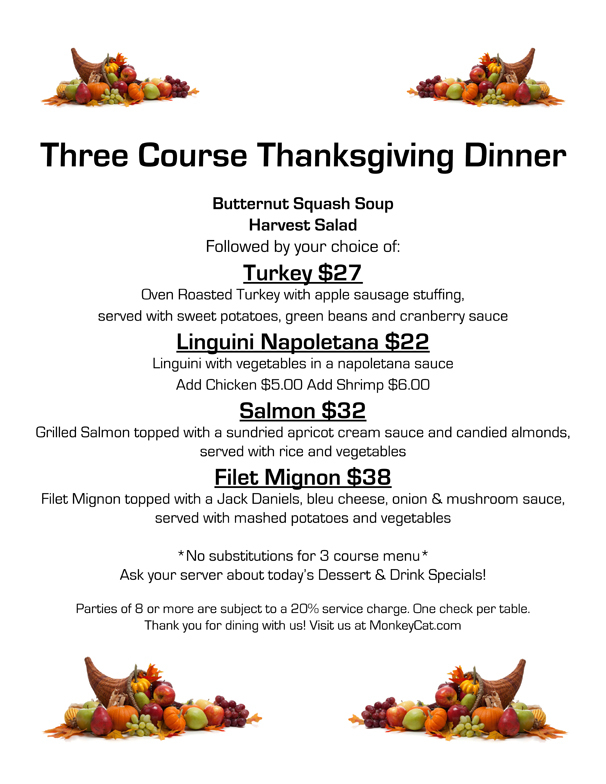 We are open for Thanksgiving again this year & are accepting reservations. We open at 2:00 and the latest that you may make reservations is 6:00. During major holidays, such as Thanksgiving, reservations are absolutely required. At this time you may make reservations by using our opentable system. If you call the restaurant, you will be directed to go online to make reservations. The only exception is for parties of 8 people or more. If you have a larger party, please call us and we will take your name & number and see if we can accommodate your party. Reservations left on the phone are not guaranteed. To view all of our available times for tables – please visit us at http://www.opentable.com/monkey-cat – this will stay up to date with our available times. We will be confirming every reservation, so please make sure you leave the correct contact information. If you do NOT confirm your reservation the week of Thanksgiving, your reservation will be CANCELLED and given to another party. We usually sell out a week or two prior, so if you’d like to dine with us, do not delay in making your reservation. No Replies to "Thanksgiving Menu & Thanksgiving Reservations"